Hiking Sticks – what, why and how to use them. Hiking staff, trekking poles, walking sticks. All have different uses, but serve a similar purpose. All add stability to your step and reduce strain on your knees. All hiking assists have different methods of helping the hiker along. Read below to differentiate the types of assists and choose which works best for you. Many hikers use different aids for different terrain and goals. Mountain trails have different needs from flat trails. Winter treks have different needs from summer hikes. Every cub or scout will remember the hiking staff. About armpit high, usually cut from a fallen tree found along a hike, these staffs have been a mainstay for hundreds of years. Some are carved with inch marks, some had designs from each camp carved into them to become an owner’s story. Make your own by finding a hardwood stick about half-wrist thick, about armpit to ground length (longer is okay, you can always cut it down) and as straight as possible. Some choose to wrap the handle end (whichever you decide) in leather lacing and leave a wrist loop. Back-splicing on the leather looks impressive. Some shape the ground-end into a point. Do so in fire by holding the end over coals and rotating. As the wood dries it will gradually come to a point and become hard. The hardened tip will add to longevity. Some enterprising outdoorsmen have even used plant dyes to colour their staffs. These are the most personal, almost romantic of the aids. There’s nothing mechanical about the homemade staff. It is worth noting that there are manufactured staffs (like this one) that serve the same function, but not with the same fashion or nostalgia. For the traditional camper/hiker, the hiking staff is a go-to from days bygone. 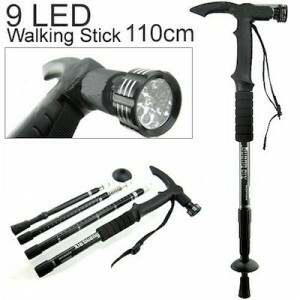 The advantages of a hiking staff such as this are the strength and length. Two can be used to improvise a stretcher in the event of an injury. Two can be lashed together to make a drag-sled (learn about lashing and knots here). Long enough hiking staffs have been used as poles for emergency shelter repairs and lean-to frames. The uses are limited only by your needs and imagination. The hiking staff is typically heavier than trekking poles or walking sticks. The staff also is less effective at cushioning knees than trekking poles. No other option can compare to its ability to support the weight of a hiker going up or down hills, nor its benefit when traversing water. Trekking poles are a little shorter (just above navel height typically) and commercially made. Carbon fibre poles are lighter than aluminum, but both are quite lightweight. Most feature a hardened ground-end tip. Some of the best trekking poles (like these ones from Kelty) offer a cushioning system, typically spring based, to reduce shock. This can come in very handy on a long trek or hike in the wilderness. By walking with trekking poles, part of the weight of the upper body (and pack) is redistributed to the poles instead of all being carried by the legs. Trekking poles also serve to steady hikers across rough terrain, test the waters of a stream before crossing and rig up shelters. Some trekking poles put features like compasses (learn how to use a compass here), thermometers and flashlights in the ends. While these are handy additions, the quality and function of the pole and shock system should be paramount. Look for quality materials in the grips, and grips that fit the hand comfortably. If planning a winter hike, test with gloves and boots on for proper height and grip sizes. Walking sticks and canes are often synonymous. Typically waist high or a little taller, the materials from which a walking stick can be made are virtually limitless. Many people use a walking stick in their daily lives to add balance and support to their travels. For the purposes of hiking, look for a walking stick with a hardened tip and shock absorbing properties like trekking poles. Wrist straps are always handy. Collapsible walking sticks take up less space in camp. Also like trekking poles, walking sticks often have accessories attached to them (like this one). Comfort and durability are the features to look for in a walking stick. With both trekking poles and walking sticks, the cone (usually removable) at the bottom is for soft ground and snow. Keep those handy. Once you’ve chosen your preferred hiking aid, use it correctly. Sized properly, these tools will help keep your knees happy during a hike. With a hiking staff, it should make contact with the ground between steps, and beside the rearmost foot. It acts almost as a come-along to propel you forward. by angling it slightly forward and pushing down on it with the step, the step requires less effort. When walking downhill, plant the stick in the ground before you and push it into the ground to slow your pace and provide stability. Trekking poles should move with the opposing foot. The pole in the left hand moves with the right foot and the pole in the right hand moves with the left foot. This will help with balance and stability, the whole point of a hiking assist. Descending should typically be done with the body sideways to the slope and bisecting the slope’s angle to reduce the drop with every step. This decreases the strain on joints and reduces the opportunity for a fall. When crossing moving water, use your aid to test the stability of the bed in front of you. keep the aid (staff pole or stick) firmly planted downstream of your body and use it to balance. Test each step before moving and always have two points of contact with the bed (one foot and the pole or two feet). Lean up-stream and go slowly. Never rush through moving water.